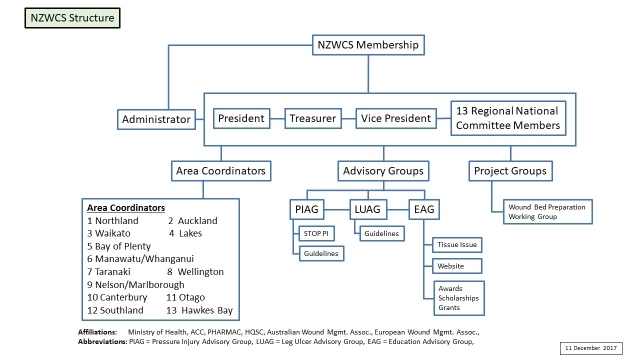 New Zealand Wound Care Society? We are a group of health care professionals, from a range of disciplines, who share a common interest in wound management. Our members share experiences, expertise and knowledge and network with other members around New Zealand. To improve outcomes and quality of life for patients with wound and skin integrity problems. To be a recognised voice at national and local level in any issues relating to wound healing or maintaining skin integrity. To achieve this we focus on education and professional development, as well as fostering and encouraging an evidence-based approach to wound management. We hold regular local education sessions and study days, organised by Area coordinators, and a biennial national conference. We have thirteen branches: Northland, Auckland, Waikato, Rotorua/Taupo, Bay of Plenty, Manawatu/Wanganui, Taranaki, Wellington, Hawkes Bay, Nelson/Marlborough, Canterbury, Otago and Southland. All areas have an Area coordinator and a National Committee member. The Area coordinator is responsible for coordinating meetings and seminars for the local branch members, while the National Committee member represents each branch at a national level. In some areas these duties are undertaken by the same volunteer. We have 3 full time sub groups - Pressure Injury Advisory Group (PIAG, Leg Ulcer Advisory Group (LUAG) and the Education Advisory Group (EAG). In addition to these we set up Project Groups for time to time. The Wound Bed Preparation Working Group (WBPWG) and any other that the Society feels we have an need for. The Society has a selection process for each of these groups. When new members are being sought we send out an Expression of Interest (EOI) to the whole membership, encouraging our passionate members to put themselves forward for consideration. Online access to EWMA journal - the official journal of the European Wound Management Association (3 x year). 'Members Only' access to NZWCS website. The NZWCS membership year runs from 1st July to the 30th June inclusive. To join the NZWCS complete the on-line form and make your membership fee payment to the NZWCS bank account given on the invoice.